A rapidly evolving bill that creates a new felony crime for kickbacks and bribes connected to human services subsidies is moving through the House. House File 2319 was quickly assembled by Rep. Dave Pinto, DFL-St. Paul, and is among a bevy of House and Senate legislative responses to a March 13 Legislative Auditor’s report on child care fraud. Auditor Jim Nobles’ report was unable to quantify fraud in Minnesota’s Child Care Assistance Program (CCAP), but says it likely exceeds the $5 million to $6 million proven through recent county prosecutions. The program subsidizes discounted day care for 30,000 low-income Minnesota children. The Pinto bill—as passed by the House Judiciary committee on March 20—contains provisions granting civil immunity to good-faith fraud tipsters and that permit sharing of Human Services fraud-investigation data with law enforcement. It also aligns state welfare fraud civil penalties with the federal False Claims Act. But its big club is a new felony crime for kickbacks associated with CCAP and other human services programs. The Legislative Auditor’s report said that Human Services and Bureau of Criminal Apprehension investigators both uncovered numerous instances of child care providers recruiting CCAP-eligible mothers by offering kickbacks in exchange for enrolling children. “It is very common for center owners to pay kickbacks to the mothers of $200-plus per child per month,” the report says. Kickbacks as high as $300 per month per child were found, it says. In other cases, the report said, CCAP-eligible mothers were given jobs in exchange for enrolling children—effectively paying them to watch their own kids. Pinto’s felony provisions extend to both the providers and recipients of kickbacks or bribes, he said. Offenders could be punished by up to five years in prison and a $15,000 fine. An extensive HF 2319 amendment was added Thursday morning by the House Early Childhood Finance and Policy committee, which Pinto chairs. Much of the new language deals with license administration, suspension and appeals. But it also spends $700,000 in fiscal years 2020-21 for DHS to contract with the BCA for two additional child care fraud investigators; two BCA agents already perform that work at DHS. The amendment also spends almost $3 million on eight new child care licensing workers, two data analysts and four DHS Inspector General’s office investigators. And it allows the DHS commissioner to immediately suspend any child care license holder who is criminally charged with fraud. The Early Childhood committee went into recess without voting on the bill early Thursday. It planned to reconvene after the House floor session that evening. That was after this story’s deadline. Noble’s 64-page report details his probe into allegations that half of the money distributed through CCAP—about $108 million of the $254 million paid out in 2018—consisted of fraudulent payments. The auditor was unable to substantiate that claim, which originated with CCAP Investigations Unit Manager Jay Swanson. His charges surfaced publicly when Scott Stillman, a former DHS employee, described them in an interview with Fox 9 TV and in testimony before House and Senate committees last year. While Nobles’ report could not validate those claims, it described intense friction and distrust between DHS’ internal child-care fraud investigations unit and its Inspector General, Carolyn Ham. Ham last week was placed on leave, reportedly against her will. Nobles followed the March 13 report with a March 19 letter to lawmakers. There he calls on the state to totally transfer child care fraud investigations out of DHS and into the BCA. The auditor plans a follow-up report in April to spell out recommendations for improving CCAP’s internal controls. It was against that backdrop that the Pinto introduced his bill, which he said reflects Gov. Tim Walz’s priorities for reforming child care and tackling fraud. It was heard in House Judiciary on March 20. The bill had a slightly confused time of it there. After Chuck Johnson, the DHS deputy commissioner, outlined its relevant sections for Judiciary committee members, a question arose as to whether the bill’s criminal penalties were Judiciary’s purview. 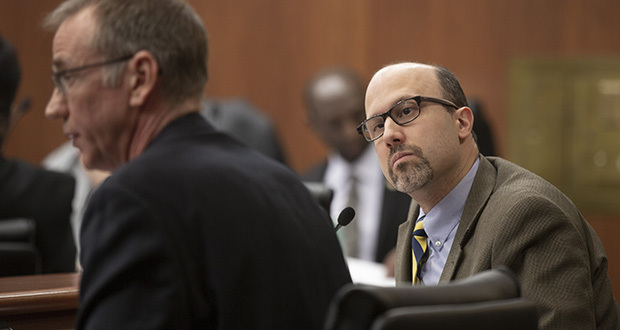 Rep. John Lesch, DFL-St. Paul, the committee’s chair, said he did not think the bill’s criminal section needed to be reviewed Wednesday because it fell within the scope of House Public Safety—a committee that has significant overlap with Judiciary’s mandate. But there was a problem with that: House Public Safety is not scheduled to hear the bill. However, the Public Safety chair, Rep. Carlos Mariani, DFL-St. Paul, also sits on Judiciary and was present Wednesday. He said he had no objections to questions being raised about the criminal provisions while the bill was parked in Lesch’s committee. That allowed Rep. Marion O’Neill, R-Maple Lake, to raise concerns. She noted that the bill outlines just one fine and one maximum prison term, regardless of how much money is involved in a kickback scheme. “It’s five years and it’s $15,000 for the smallest interaction to the most egregious,” she said. “I’m just saying it should be weighted in some way.” Pinto said that was “a terrific point” and promised to consider it as the bill moves ahead. Rep. Peggy Scott, R-Andover, offered another suggestion, though hers received no immediate feedback. She noted that the bill before Judiciary allowed the DHS commissioner to suspend providers who get convicted of fraud. Scott didn’t think that went far enough. Immediately after she spoke, a motion was made to approve the bill and send it to Ways and Means for re-referrals. Still, while Scott received no response on Wednesday, Thursday’s amendment did add language allowing the commissioner to suspend a provider who is merely charged with fraud. House File 2463 (Pinto) modifies eligibility and participation requirements for early childhood, child care and family support programs. House File 1680 (Rep. Lisa Demuth, R-Cold Springs) clarifies CCAP record-keeping requirements. House File 497 (Rep. Mary Franson, R-Alexandria) prohibits child care providers from receiving CCAP reimbursements for their employees’ dependents. Senate File 1845 (Sen. John Jasinski, R-Faribault), restricts family members from receiving public assistance for the hours they work in a child care setting. That’s similar to the Franson bill, but they are not companions. Senate File 1846 (Jasinksi) requires child care business receiving $250,000 or more in CCAP funds to hold a surety bond of $100,000, to protect taxpayers against fraud. Senate File 1367 (Sen. Karin Housley, R-St. Marys Point) allows data sharing between DHS and the Minnesota Department of Education and prohibits CCAP-disqualified families or programs from receiving early learning scholarship funds. Senate File 4 (Sen. Jerry Relph, R-St. Cloud) requires child care businesses to maintain accurate and legible daily attendance records and turn them over on demand to counties or the DHS commissioner, as a condition of CCAP funding. This addresses a key concern in the Nobles report, which suggested that poorly maintained and tracked attendance records—upon which payments are based—are almost an invitation to fraudulently pad attendance tallies. Meanwhile, Sen. Mark Koran, R- North Branch, has publicly called for new leadership in the Investigator General’s office.